Barn World offers a wide selection of livestock scales. 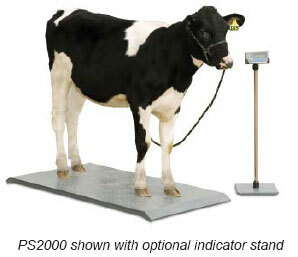 If you need a livestock scale, one of our animal scales will certainly fit the bill. Our most popular a very versatile 4H livestock scale is a multipurpose livestock scale designed with 4-H in mind. Weigh pigs, sheep, goat, calves up to 1,000 lbs. 55.5″x20.1″ mild steel platform scale with end ramps. Pre-calibrated to a stainless steel digital indicator. Includes 6VDC rechargeable battery and AC adapter. An optional indicator stand is available. Portable– The PS1000 weighs only 60 lbs, two easy access carry handles makes this scale convenient to relocate. No need for ramps or recessed floors, as this unit comes with ramped ends. Construction – Rugged steel with tread plate surface protects animals and handlers from accidental slips and falls. Adjustable foot pads allow scale to work effectively on uneven floors. A very touchlivestock scale. Easy Assembly – No installation costs or parts that require maintenance. Just place the scale on a hard surface and level by adjusting the foot pads. Connect the indicator and turn on the power. Perfect for a 4H livestock scale. Call (720) 238-2190 or visit BarnWorld.com today!